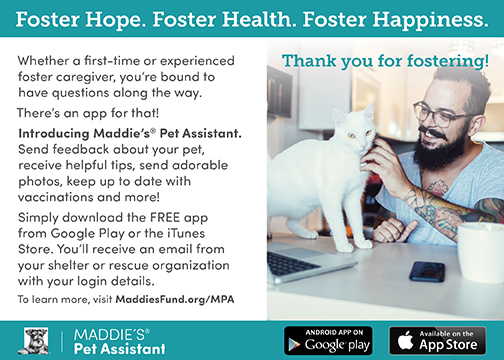 Maddie's® Pet Assistant is a tool to help foster caregivers or adopters with enhanced support for questions or challenges, while providing valuable insights to your organization. 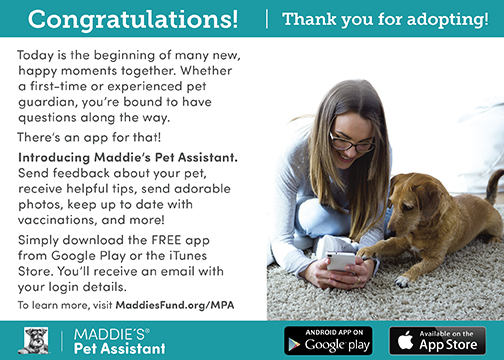 "Maddie's® Pet Assistant is an EXCELLENT service. I was very impressed. 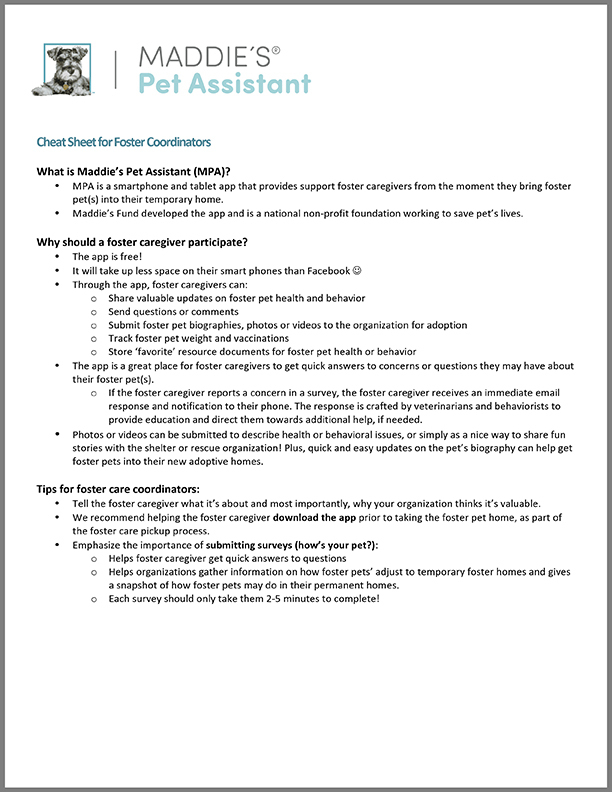 A lot of folks, including myself, figure we "know our stuff" but even a "seasoned professional" can ALWAYS benefit from updates and/or refresher info!" 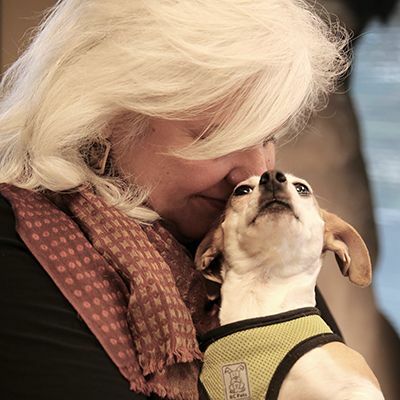 This video is for all your current and future foster caregivers. 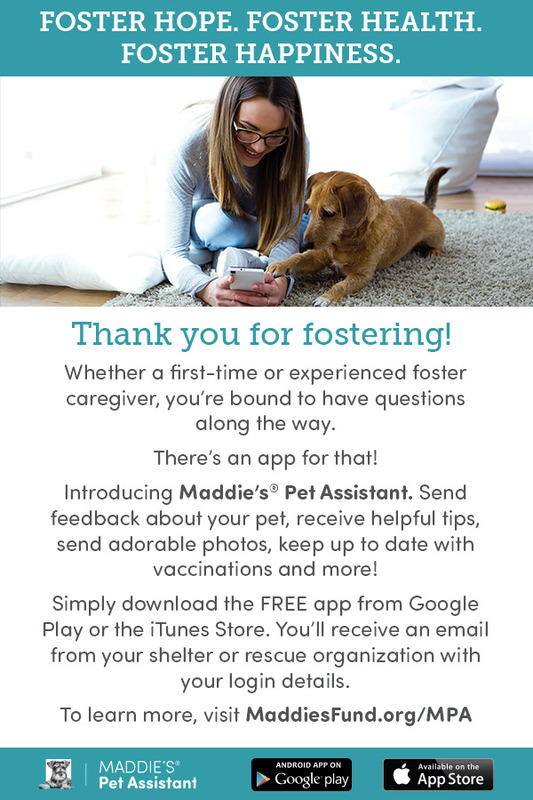 You can play it during caregiver orientations, add the YouTube link to emails or newsletters, or add it to add foster care training materials! 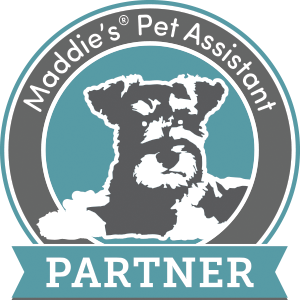 Download our partner badge document and use the provided html code on your website to show you proudly use Maddie's® Pet Assistant! 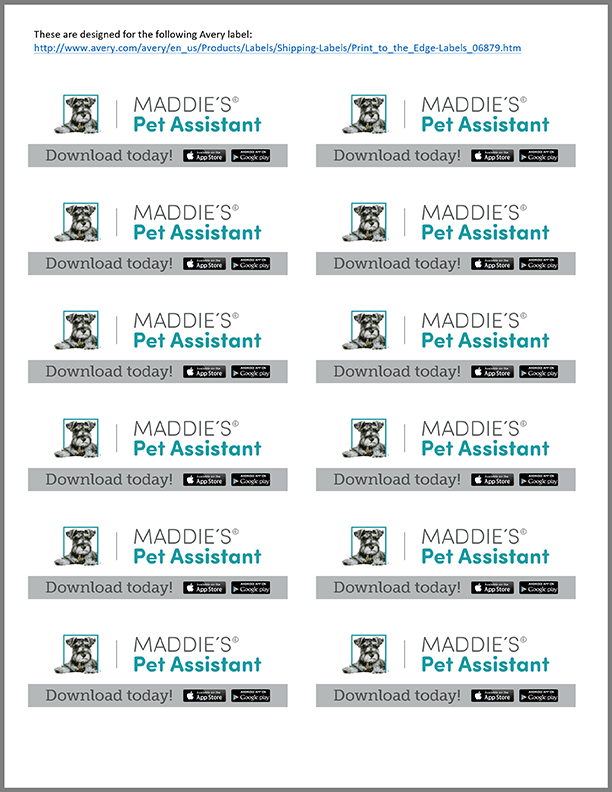 Download our mailing labels template to print your own. These are designed for the Avery Product Number: 6879 labels. Both an e-card for dogs and cats (shown) to attach to emails and printed postcard for dogs and cats to print your own postcards. 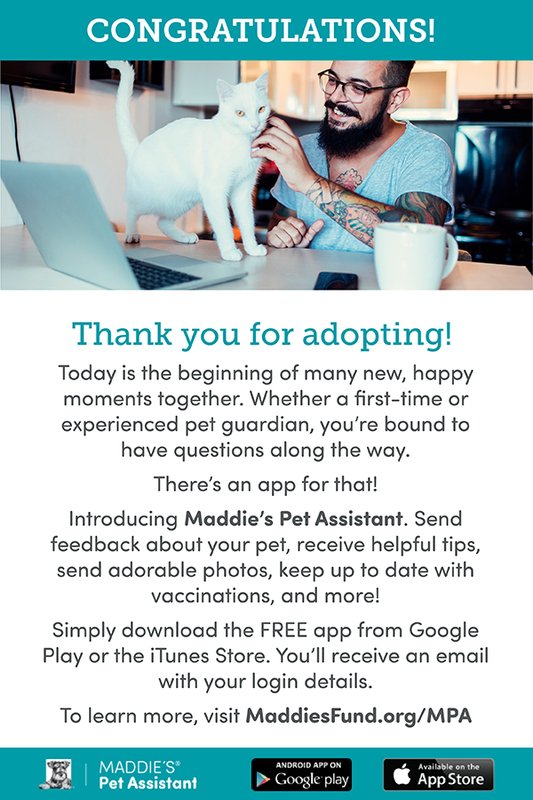 An email image for dogs and cats (shown) to drop into your email provider to send to your foster caregivers. Simply click the link and right click to save the image to your desktop. 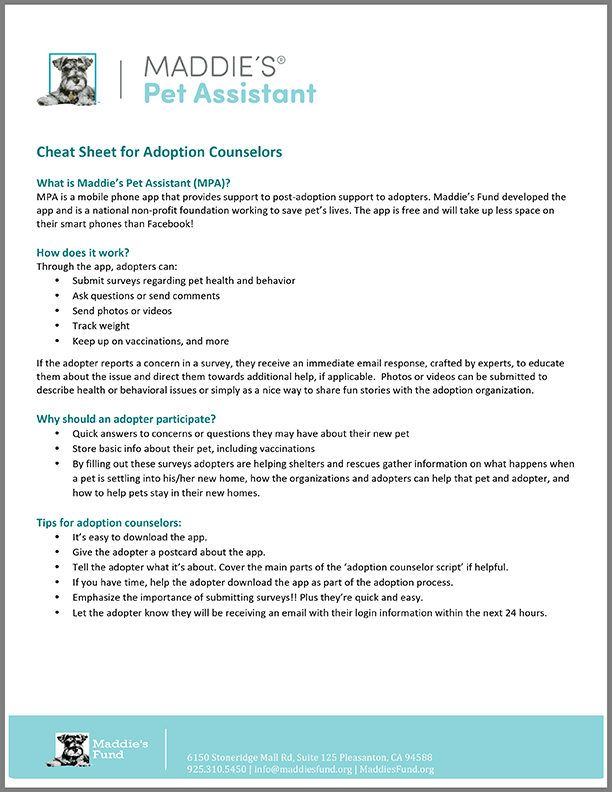 A marketing cheat sheet to encourage your foster caregivers to utilize the Maddie's Pet Assistant tool. Both an e-card for dogs (shown) and cats to attach to emails and printed postcard for dogs (shown) and cats to print your own postcards. 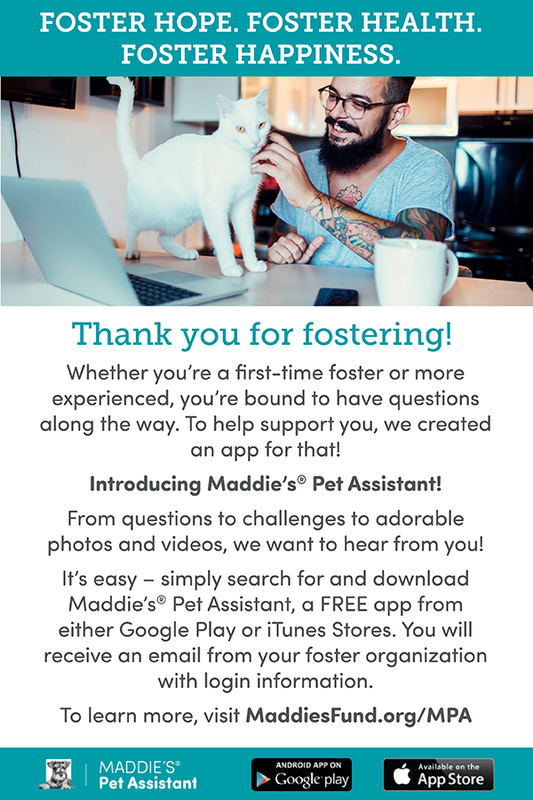 An email image for dogs (shown) and cats to drop into your email provider to send to your foster caregivers. Simply click the link and right click to save the image to your desktop. A marketing cheat sheet to encourage your adopters to utilize the Maddie's® Pet Assistant tool. 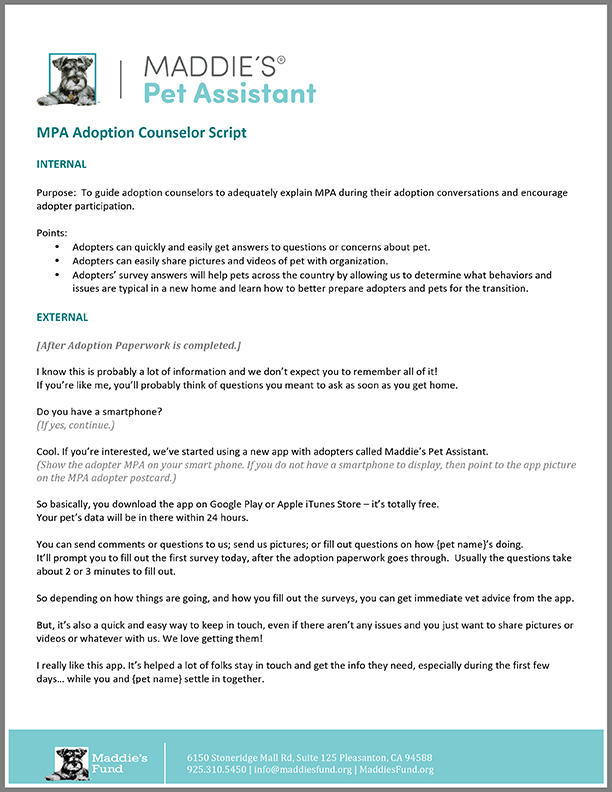 An adoption counselor script with both internal and external talking points encourage your adopters to utilize the Maddie's® Pet Assistant tool.